Hobe Sound has a special place where anyone can join a trip to the beach, after dark, to experience the wonder of life through the eyes of the female Loggerhead Sea Turtle. The Loggerhead Sea Turtle is the largest sea turtle in the world. Adults can weigh between 200 and 350 pounds and reach 3 feet in length. 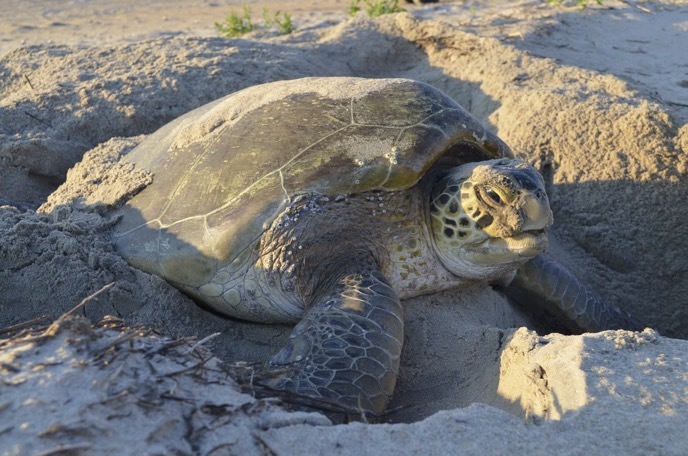 Ninety percent of Loggerheads nest in five counties on the eastern seaboard of Florida and their nesting activity is highly monitored. Female Loggerheads return to land to lay their eggs at night between February and September each year. She lugs her heavy body onto the beach and makes her way to a spot to nest. First she digs a pit, using her powerful flippers to move the sand aside, then deposits up to 120 eggs. Once finished, sand flies as she covers the eggs before returning to the ocean. From May through July 21st, the Hobe Sound Nature Center at 13640 SE Federal Highway offers specially permitted walks by the US Fish and Wildlife Conversation Commission and US Fish and Wildlife Service so kids and adults can learn about these endangered reptiles and experience a female Loggerhead lay her eggs in the sand. The center is a mere 5 minute drive south of Floridays RV Park. Walks begin with a short educational talk, then everyone drives themselves to a nearby designated public beach where spotters guide the group to an area with an active female Loggerhead. The Turtle Walks are immensely popular in the summer months, and they are always fully booked. But cancellations do happen and there’s a waitlist you can join by calling (772) 546-2067 or by making a reservation online. There’s a donation of $5 per person requested and highly appreciated. If you go on one of the Turtle Walks, share your adventure with others by posting your photos on our Facebook page.